The great outdoors of the Pacific Northwest and its inspiring Coastal knitting tradition is reflected in this hearty shawl collared cardigan. Chic Knits PNW #1 features elegant but easy-to-work top-down techniques, raised stitch motifs on front and back, and uses heavy worsted gauge yarn for speedy knitting and ease-in-making. 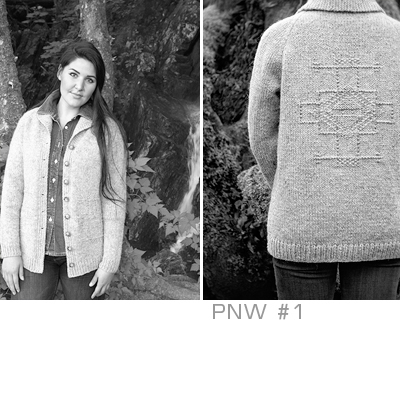 Whether you're hiking in the rain forest or walking the dog in the city, Chic Knits PNW #1 is that basic friendly cardi you'll love to wear.